Thomson, Amanda (2018) Wigtown Book Festival, Main programme event: A Scots Dictionary of Nature. In: A Scots Dictionary of Nature, 27 September 2018, Wigtown Book Festival, Wigtown. 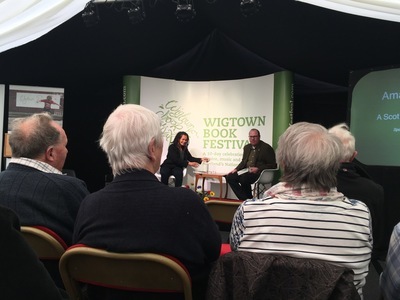 Wigtown Book Festival is based in Wigtown, Scotland's National Book town, in Galloway. 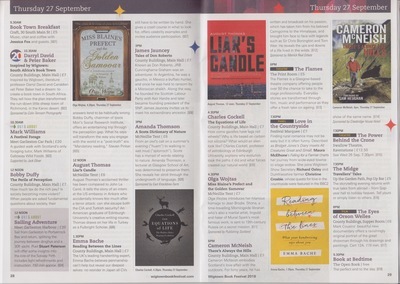 The book festival is in its 20th year. I was invited to speak about my book, A Scots Dictionary of Nature. "From an owl's call on a summer's evening (huam) to walking in wet mud (splorrach), Scots has a myriad of words relating to nature. Amanda Thomson, a lecturer at Glasgow School of Art, was determined to preserve them. She reveals her stroll through the undergrowth of language".